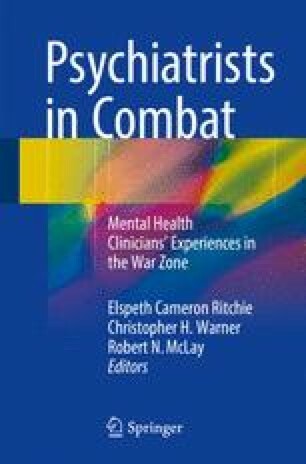 In 2005, I graduated from my Psychiatry/Family Practice residency program and shortly thereafter found myself on a plane headed to a combat zone in Iraq. This account highlights key lessons learned during those first crucial months in the war zone including establishing rapport and respect with soldiers, not being limited by a physical clinic, prudent risk taking, and the realization that you are held to a higher standard. My unanticipated military journey began in 1991. I was a junior in high school who was looking at numerous college opportunities with a plan to do premedical studies and become a physician. At that time, I planned to attend an accelerated medical program and then find a pediatric residency training program near my hometown. I expected that after completing my training, I would return to the area that I grew up in the Ohio River Valley near Pittsburgh, Pennsylvania and become a small town doctor. However, during that year of high school something life changing occurred when Saddam Hussein invaded Kuwait.